Recently returned to the U.S. from Finland with the gold-medal winning U.S. Under 18 team, 2014 recruit Jack Eichel has signed his NCAA National Letter of Intent to play hockey at BU next season. Tomorrow morning BU will announce Eichel and five other members of its nine-man 2014 recruit class via the @terrierhockey twitter account. 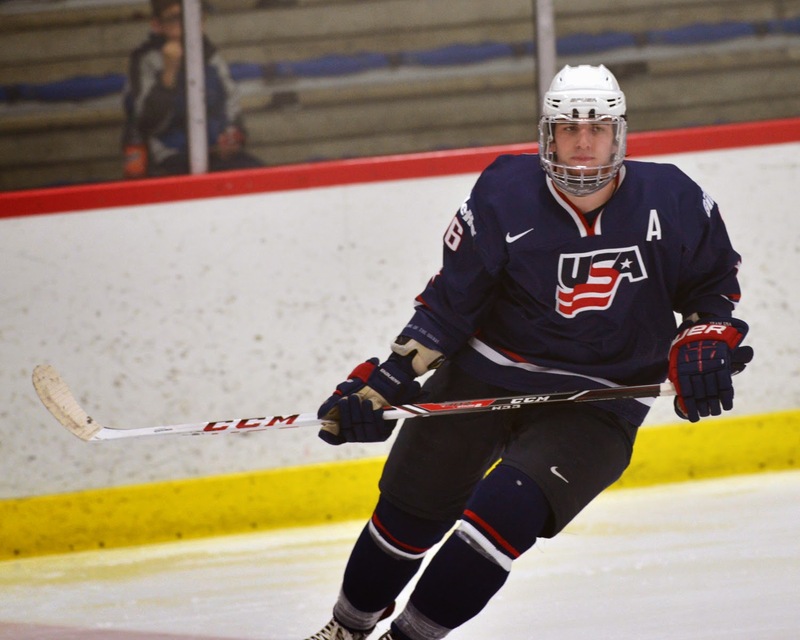 United States of Hockey's Chris Peters examines Eichel's strengths achievements and the certain competition with Canadian Connor McDavid for being selected #1 overall in the 2015 NHL draft. A couple of Anaheim Ducks fan sites have hung the title of “Captain Clutch” on Nick Bonino, after his overtime winner in game six of the Ducks-Stars series—following his goal late in the third period that helped Anaheim rally from a two-goal deficit. It’s a nickname that had been earned by another former BU captain and Connecticut native, Chris Drury, for his penchant for scoring key goals in Stanley Cup playoff games. Drury, who is BU’s all-time goal scoring leader with 113, racked up 47 playoff goals,including 17 game-winners, so Bonino has a ways to go emulate those numbers. But he’s off to a good start. The Ducks have won seven playoff games in the past two seasons and Bonino has three GWGs, two of them in overtime. Confirming reports posted here earlier this month, former BU captain Albie O’Connell is joining the Terrier coaching staff, replacing Buddy Powers. Head Coach David Quinn told The Daily Free Press that O’Connell will be an assistant coach, but focused on recruiting where he has had an impressive track record in the past three seasons at Harvard and before that at Northeastern and Merrimack. O’Connell, who was a member of one of only four BU classes to win four Beanpot titles and also skated in two Frozen Fours, led the Terriers in scoring as a senior with 39 points and had a career total of 108 points (42G, 66A). 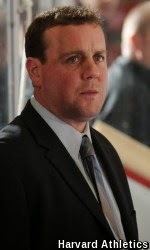 After graduating from BU in 1999, he played in the ECHL and the British National League, where he led the Basingstoke Bisons in scoring with 74 points. The Los Angeles Times spoke with Long Beach, Calif., native Matt Nieto about facing the team he rooted for as a youth, the Kings, in the Stanley Cup playoffs. 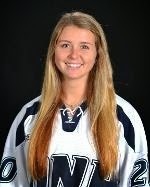 The Terriers blueline for next season received a significant boost when defenseman Alexis Crossley revealed that she is transferring from New Hampshire to BU. 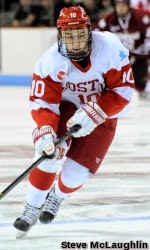 Crossley, who hails from Cole Harbour, Nova Scotia, played at Shattuck St. Mary’s prior to UNH, where she was a teammate of BU sophomore Rebecca Russo. Last season, as a sophomore, she was an assistant captain and scored eight points in 25 games, missing time due to a broken collarbone. As a freshman, she was second on the Wildcats in scoring with a 7-17-24 scoring line and was named to Hockey East’s All-Rookie team. Down two goals with less than three minutes left in regulation—then a frenzied comeback and OT win? As Terrier fans know, Nick Bonino has been there, done that---successfully. So last night when Anaheim snatched victory from the jaws of defeat in game six of its series with Dallas, it had to seem like “déjà vu all over again” for the former Terrier captain and sniper. The script was a little different from BU’s D.C. Miracle in the 2009 National championship game, when Bonino sent the game into overtime with a one-timer that saved the Terriers season. The Ducks, seeking to close out a stubborn Stars club, were trailing by two for the third time in the game and had pulled their goalie. Bonino took a pass behind the Dallas net, skated out to the side and roofed a shot over Kari Lehtonen to close the gap to one with 2:10. Then he was involved in the mad scramble in front of the Dallas cage that saw the Ducks knot the score with 24 ticks left on the clock. And 2:47 into overtime, Bonino, standing just at the edge of the faceoff circle, wristed a dart past Lehtonen, clinching the series for Anaheim and ending the season for Dallas and Alex Chiasson. 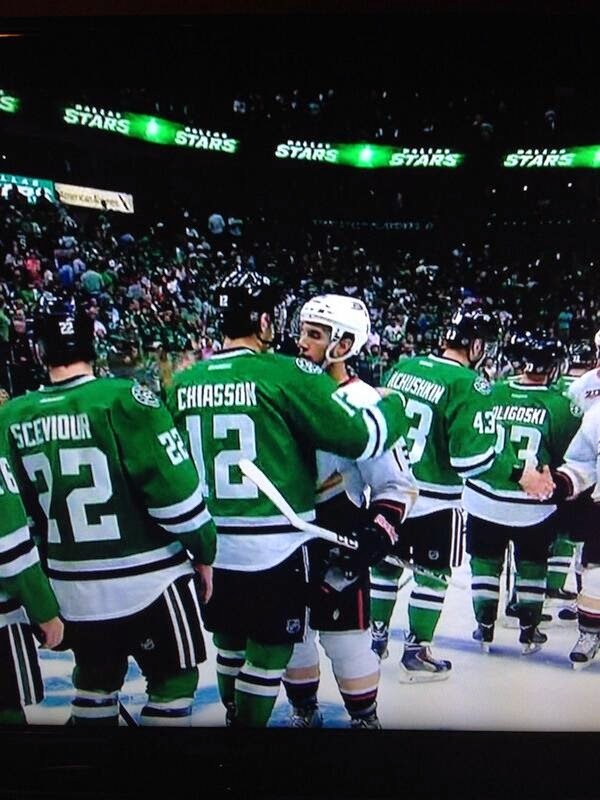 The two ex-Terriers shared a hug in the post-game handshake line. Bonino, who is featured in the current issue of The Hockey News (“This Duck’s Rise is Mighty”) earned the game’s first star as well one of ESPN’s three stars of the night. The season also came to end for Kevin Shattenkirk, whose St. Louis Blues were eliminated by defending champion Chicago, 5-1. The former BU captain and All-American recorded a career-best 45 points during the regular season and also played for Team U.S.A. in the Winter Olympics. Another former BU defenseman, Adam Clendening, is on the Blackhawks roster for the playoffs, but has yet to appear in a game. Half a world away in Finland, Team USA completed its run to the gold medal in the IIHF World U18 Championships, defeating the Czech Republic, 5-2. 2014 recruit Jack Eichel helped Team USA get on the board early with a stretch pass leading to a rebound goal. Later in the first period, 2014 recruit Johnathan MacLeod assisted on a goal that increased the lead to 3-0. Two more U.S. goals in the second put the game out of reach. 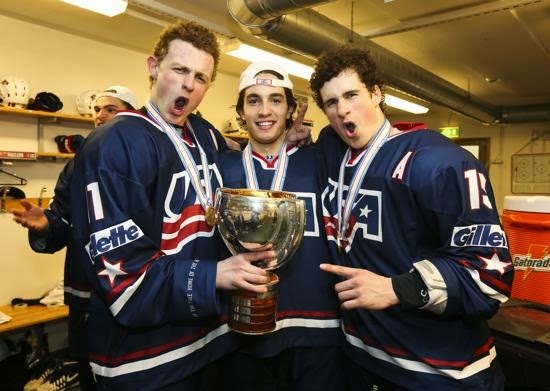 Eichel (left in photo), who was named one of Team USA’s three best players in the tournament, finished the tournament with a six-game point streak, scoring five goals and five assists, including the game-winner in the Group B clinching game vs. Finland and goals in both the quarterfinal and semifinal games. His season total of 87 points (38G, 49A) in 53 games—including seven game-winning goals--led the U18s and is the fourth highest single-season point total in NTDP program history. MacLeod finished the year with five goals and six assists. ● Hockeysfuture.com interview with Eichel discussing the tournament and his future plans. Danny O’Regan’s spin-o-rama goal against Vermont earned #2 honors in the NCAA’s reel of top 10 goals of the 2013-14 season. The sophomore from Needham finished the season with a 10-12-22 scoring line. Co-captain Garrett Noonan’s entry level contract with Nashville is official. 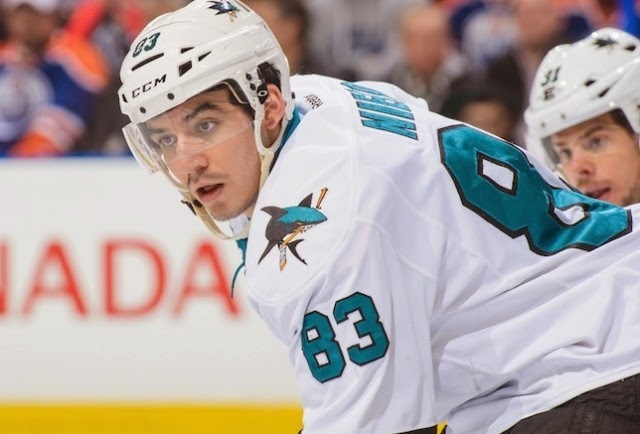 Noonan will be suiting up for the AHL Milwaukee Admirals in the Calder Cup playoffs against Toronto beginning Friday. With a slick individual effort, 2014 recruit Jack Eichel scored the game-winning goal with just over a minute left in regulations as Team USA edged host, 4-3, Finland in the final preliminary round game at the 2014 IIHF World U18 Championships. The win clinched first place in Group B and will take on Slovakia in a quarterfinal game tomorrow beginning at 6:00 a.m. ET. The game will be live streamed for free by Fast Hockey. Anticipated to be one of the top 2015 NHL draft picks, Eichel is a featured topic in OverTheBoard’s “Isn’t It Obvious” column for April, which also mentions several other Terrier recruits. With his father in attendance, Matt Nieto redirected a shot past Jonathan Quick to record his first NHL playoff goal in the Sharks’ 4-3 overtime win against the Kings. Brandon Yip scored a short-hand goal and then on a penalty shot to rally AHL Portland to a third period tie, but the Pirates fell, 4-3, to St. John.